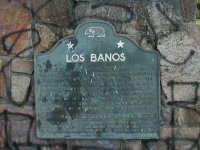 Los Banos (the baths) del Padre Arroyo, visited as early as 1805 by Spanish explorers, was a favorite place for padres from San Juan Bautista Mission during their travels to the San Joaquin Valley. 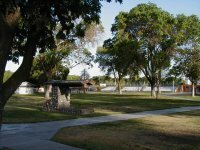 Its name was changed to Los Banos Creek by later American emigrants. 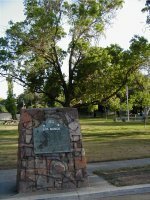 The town of Los Banos was established at its present site in 1889, after the post office of Los Banos was built near the creek in 1874.